(HIBURAN) Media Prima Chinese New Year campaign – rosperity for all this Year of the Rooster! PETALING JAYA, 20th November – Get ready to usher in the Year of the Rooster with a major celebration this Chinese New Year! 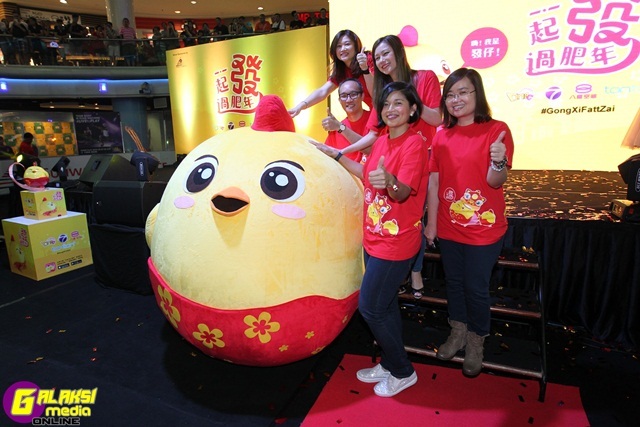 Media Prima’s One FM, ntv7, 8TV and tonton have initiated a Chinese New Year campaign, which encompasses a wide range of activities and goodies which are sure to spread the joy and happy DNA nationwide during the festive season. The campaign launch was held on 20th November 2016 at the Sunway Pyramid Ice at 3.00pm. Perking up the campaign were a total of 28 artistes; 10 One FM DJs, Nicholas, Angeline, Kyan, Hana, William, Yin, Brandon, Angel, Stephany, and Gigi; the ntv7’s top 10, Kyo, Pauline, Jeffrey, Joey, Henley, Emily, Wilson, Sherlyn, Ziah and Lynn; 8 hosts of 8TV, Gary, Rickman, Wind, Desmond, Mei Sim, Orange, Natalie and Chrystina; and the mascot, Fatt Zai (which means prosperity) who made their appearance. Apart from the mentioned names above, the CNY 2017 Campaign Buddy, Min Chen too made her appearance during the launch. She was chosen as the Campaign Buddy for her bubbly and blithesome character. An album was released in conjunction to the Lunar New Year, featuring the 28 artistes present during the campaign. The album, Cheers to a Prosperous CNY 2017, includes five tracks; the CNY theme song by the 28 artistes titled Yi Qi Fa Guo Fei Nian (Let’s have a joyous year), two theme songs for CNY dramas from ntv7 (Into the Phoenix) and 8TV (Little Lion Dance), a song by the One FM DJs titled Xin Nian Hao Hao Wan (New Year is fun) and a special song by the CNY Campaign Buddy, Min Chen titled Kuai Le Yue Ding (Happy together). The album was released during the campaign launch. For those who enjoy karaoke, from 5th December 2016 onwards, the CNY theme song, Yi Qi Fa Guo Fei Nian and Min Chen’s Kuai Le Yue Ding will be available in all Red Box and Green Box Karaoke. “Chinese New Year is all about sharing the joy and exultation with everyone around. This year we collaborated TV, Radio and Digital together; One FM, ntv7, 8TV and tonton. We have plenty in store for our loyal viewers and supporters. Thank you to all our sponsors and co-organizers, F&N, TESCO, SPORTS TOTO, PETRON, SUPER, COCA-COLA and UNILEVER for willing to cooperate with us in this campaign. Let us welcome the Year of the Rooster together,” said Datuk Kamal Khalid, Chief Executive Officer, Media Prima Television Networks (TVN). CNY merchandises CD+DVD albums, soft toys and t-shirts, and back to school items, tuition bags, water bottles and so many more were promoted during the launch and are sold in Popular and CD Rama. The items will be up for grabs beginning 21st November 2016 (Peninsular Malaysia) and 28th November 2016 (Sabah & Sarawak). Even greater news, from 9th December 2016 onwards, the campaign will introduce the One FM, ntv7, 8TV and tonton CNY 2017 Mobile truck. The mobile truck will travel throughout the Peninsular Malaysia and with it bring joy and prosperity to all! Visitors can take pictures with the Fatt Zai sculptures and join the fun-filled activities awaiting them. Main prizes includes a 999.9 golden egg and gold plated tin cans sponsored by 100 Plus, Sports Toto prosperity golden rooster necklaces and other merchandises from the campaign. Apart from the on-ground events, One FM, ntv7, 8TV and tonton will introduce the app, Fatt Zai for the campaign. There are plenty in store from the app, and are available on both iOS and android. Users may use the app to edit and send E-cards to anyone, keep updated with TV programmes and entertain oneself with the games from the app. Anyone who thinks they have the loudest laugh, the HAHA Metre within the app might entertain you, distort your laughter or sound like someone else! There’s more, within the app are two mini games, treasure bowl and gold rush. Collect points by playing the games and collect rare eggs from the gacha machine within the app.